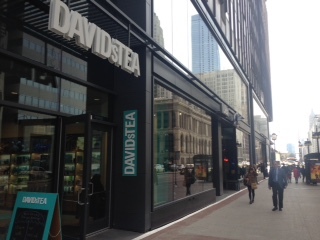 I had first come across DavidsTea visiting my cousin in Toronto, which I soon found out was the first David’s Tea ever! As a tea lover, I had to go in and try some. 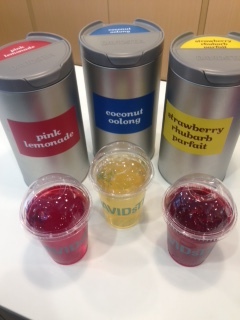 Long story short, I fell in love with the vibe, people and selection at DavidsTea. 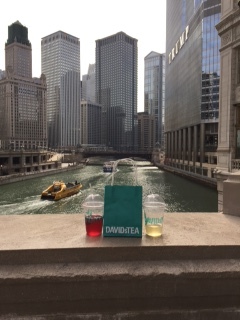 Not willing to have a long distance relationship with DavidsTea, I returned to Chicago with a few bags of loose tea but heartbroken. When I found out the company had expanded to Chicago, I was overjoyed and had to share my excitement! 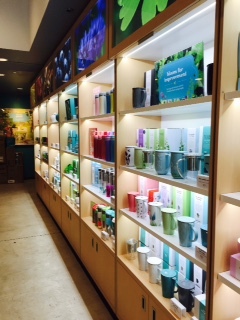 Unlike other tea places, DavidsTea also makes beauty products from their tea! 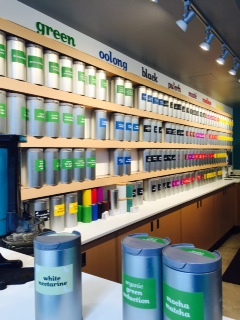 I love the selection at David’s Tea as much as I love the benefits each tea has that many people may not know of! 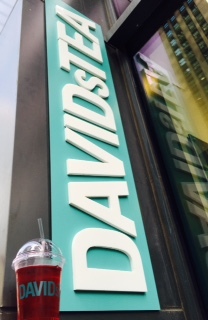 David’s Tea has 8 different types with 150 flavors! While David is the expert, I’d like to share some of my favorites and their benefits! I always drink white tea accompanied by my post work out meal because it is rich in antioxidants and promotes cardiovascular health! It also is a great way to gradually cool down because it has less caffeine than other teas. I like fruity hints in my white teas which is why I LOVE Honey, I Dew because it has hints of apple, watermelon, pineapple, and mango! Do I think you should get some after you read this? Honey, I Dew! I am a huge promoter of Green Tea and its health benefits of antioxidants, energy, and healthy weight loss. I aim to drink a cup a day to boost my metabolism. Kiwi’s Big Adventure was the first tea I ever tried from David’s Tea, where the love began. I love to make it iced in the summer time as an energizer. The kiwi flavor is unique and great to substitute for a sugary fruit juice any day! I love dessert almost as much as I love tea, but too much dessert is not good for you. I was skeptical that it could possibly taste similar to one of my favorite treats, so I bought it at my last visit to David’s Tea and it tastes incredible! The pistachios, walnuts and cinnamon entice you with tastes of this delicacy. Oolong tea is known to promote alertness, control weight, and even clear skin! Not even baklava can do that! My love for tea and need for coffee have come together to create this magnificent Black Tea! I start off every morning with black tea because of the caffeine and because it does not make me jittery as coffee sometimes does. It was hard choosing one black tea, because it’s my favorite but I wanted to point out that while I understand you coffee addicts out there, tea has different benefits that everyone should look into! Cutting down on coffee is no easy task but with similar flavors, this tea can help! You want to tell me there is chocolate in there? Yes!! I love Pu’erh because of its smooth and sometimes sweet taste goes very well with dessert! Chocolate and orange sound like an odd combination, but the sweet chocolate hints and spicy notes of orange blend together for flavor your taste buds will thank you for. Mate Tea aids digestive health and is a stimulant that enables you to stay focused! I love drinking Mate after lunch time because it makes me bounce back to work while getting rid of any bloat from my previous meal. Jungle Ju Ju has pieces of papaya and peach that will help you tackle on the jungle that is your day! Herbal tea is my best friend when I have a cold and cannot sleep. The Big Chill also has peppermint which helps relieve my stomach before bed. These benefits and the relaxing lemon, mango, mint, and vanilla notes give me a sweet taste followed by sweet dreams. Special thanks to Amanda Demas and Megan Ward for the photos! To learn more visit www.davidstea.com!